Yes, if it's pink it must be for girls. 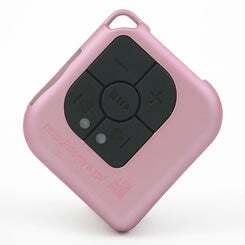 Take this portable MP3 player from Japan's Ever Green corporation. Going by the moniker of DN-2000, this SD card-based player includes no built-in memory whatsoever, making it necessary to separately purchase said SD cards. You can insert cards up to 1GB in size and then try to guess what MP3 is playing since there's no display to speak of. It's pretty much a bare bones device, powered by dreadfully old tech AAA batteries that should last up to five hours. It's certainly small enough, measuring only 2.2 x 2.4 x 0.5-inches and weighs just over one ounce. So if small, near-crippled pink MP3 players are your bag, baby, then Ever Green's little player might just be a solid addition to your purse. Oh, and it's only about $9, give or take some cents, but it's Japan-only for now.